Rent or Buy Calculator: Is it Better to Rent or Own a House? To determine if it makes sense for you to buy, first enter rental costs, including rent in dollars, rental insurance in dollars, and expected annual inflation rate. Then enter any costs associated with buying the home, including the purchase price and down payment. Follow this with the loan term, annual loan interest rate, and all the other costs associated with a home loan and home maintenance. Rent or buy, enter the number of years you plan to stay at the property. Press CALCULATE and you’ll instantly see what your costs of renting or buying will be over the period of time you indicated. More than likely, if you plan to live in the home for more than 5 years then in most places where there is not an exceptionally hot local real estate market you’ll see that you stand to save a lot of money when you buy instead of rent. There comes a time in everyone's life when they are faced with the choice to rent or buy a place to live. While this is a big and often intimidating decision for many different financial and emotional reasons, with the right research and mindset, it is not an impossible decision to make. Consider the following 11 aspects when making this important decision. The first step when considering your future residential situation is deciding what type of place you want to call home. Typically, in the past, the decision to rent or own was dependent upon whether to live in an apartment or a house. Nowadays, condos offer ownership of a multi-family residence. There are also increasing opportunities to rent a house or condo, not just own one. To make this decision easier, take a look at your lifestyle and future needs. Will you lead an active life of travel where you just need a place to crash, or are you planning on having a big family that will need room to roam? Besides your lifestyle needs, it's important to keep in mind that the type of residence will determine the price. For instance, an apartment and condo will typically be lower in cost than a house. Square footage also plays a role. The bigger the place of residence, the higher the cost. Of course, these factors are subject to the location, neighborhood, and owners and/or landlord. Depending upon the city, area, and neighborhood of where you want to settle will determine the cost and affordability of renting or buying. Currently, renting is cheaper due to the increasing home prices in Sacramento, Phoenix, San Bernardino, Riverside, Austin, and Northern Virginia. On the other hand, buying is the more economical way to go in 34 metropolitan areas including Cleveland, Chicago, and Atlanta. There are some cities that are on the fence. While renters still pay more, it is becoming more appealing to rent in St. Louis, Orlando, and Minneapolis. Owners still have an advantage in Miami, San Antonio, and Las Vegas although this advantage is slight. Of course, you do not have to move to one of these cities to rent or buy. There are options in your current city of residence. Knowing where you want to establish roots and doing research in that area can help in your final decision of choosing whether to rent or buy. Once the type of desired residence and location is determined, your financial situation will play a big role. Can you afford to buy a home? Items to consider include the ability to afford a down payment which typically ranges from five to 20 percent of the cost of the home, and closing costs which are an extra five percent of the asking price. A home buyer's initial costs will more than likely exceed the first month's rent and security deposit that renters would initially have to pay. However, there are places of rent where start-up costs can be substantially higher, so it is important for renters to be aware and cautious of that as well. After calculating out the initial payments on a house, you will also need to know how much it will cost after you move in. Financial experts recommend that your monthly mortgage payments do not exceed 28 percent of your monthly income. They also recommend that your monthly debt should not exceed 36 percent of monthly income. Going beyond these limits could lead to financial trouble. Renters, on the other hand, do not have to face these financial constraints. Renters just have to worry about comfortably affording rent and utility payments. To help calculate your finances, savings, and costs, find our calculators here. In owning a home, mortgage payments and maintenance costs will be involved. When renting, however, monthly rent and utilities are usually the only expenses associated as landlords typically pay for all maintenance and property upkeep. When buying, transaction costs for agents tend to be six to seven percent of commission on closing. When renting, the upfront costs include security deposit, first month's rent, and pet deposits in some cases. These expenses are much less than the sales commission on a home. Another consideration when buying is reselling. When you decide to resell your home, this will lead to more costs and potential financial burden. To save on an agent's commission, you can choose "sell by owner" but this could lead to a lower price and minimal visibility. On the other hand, as a renter ending your lease, it is not your responsibility to find another tenant. While there are pros and cons to costs of renting and owning, it all comes down to the most affordable for your budget. Part of your mortgage payment will go towards equity. Usually, the first few years of payments are applied to interest. Equity can take a long time to build, so it's important to stay in the house for a long time in order to reap this benefit. Accumulated home equity can also serve as collateral for a loan by easily turning into cash. Conversely, rent money is a monthly housing cost, rather than an investment like owning a home. Unlike rent payments, mortgage and property taxes are deductible on your federal income tax return. Selling your home at a profit will likely be exempt from federal taxes. Even taking out a home-equity loan may be deductible. Rent money is not. However, these tax breaks can only be applied when the amount of your itemized deductions is greater than the standard deduction amount. If your standard deduction is greater than your itemized, it is better to take the standard but that means you will not receive a tax break on your mortgage. Even when your itemized deduction is greater than your standard, you can only deduct a specific portion. For instance, if you are in a 33 percent tax break, you would get 33 cents for every $1 you spend. In some cases, the benefit of this tax break does not exceed the benefit in paying for a home in cash. Also, owning a home means paying real estate taxes every year, even if the mortgage is paid off. While rent payments do not have tax benefits, it does help that you do not have to pay additional taxes. Real estate is probably the single largest asset one can have in an investment portfolio. Over time, price appreciation on a home can be a big payoff to owning. When downsizing, many homeowners can sell at a profit which goes towards payments on a smaller, less expensive home. The excess money often times helps by adding a cushion to income. The downside to this is the fact that while your home can appreciate over time, it is not guaranteed. There are some areas where homes have lost value and cannot be sold at a profit. While renting does not lead to an investment, you can live comfortably knowing that when your lease is up you would not be losing an investment, you would just have paid for a great, care-free place to live. 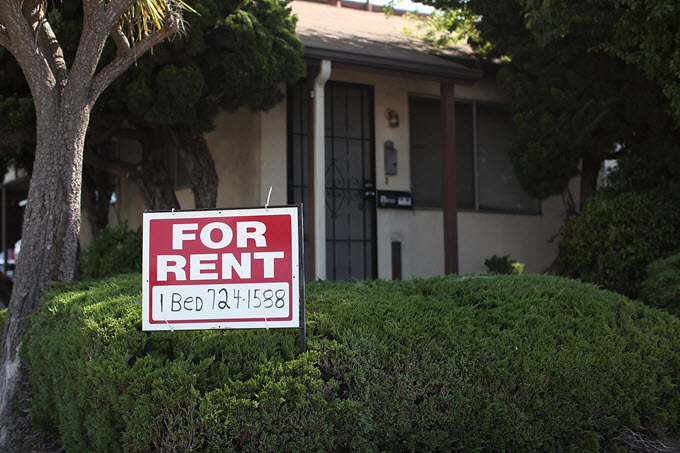 When renting, landlords pay the taxes, insurance costs, maintenance, and sometimes utilities. If you chose to buy, you can plan on yearly maintenance costs as well as replacing the roof, yard upgrades, and appliances. With this, you will never know when something will need updating or replacing. When buying, take this into consideration as these are big expenses. It is also imperative to decide how you will pay for repairs and upgrades. Will you hire out help or try to fix it yourself? Owners must make the time for these issues or cover the cost of hiring out, while landlords are in the business of maintaining properties. Renters can spend their time doing something they enjoy rather than repairing and maintaining a property. If you are looking for a secure place to live, renting may not be for you. Renters should keep in mind that their housing destiny is up in the air as landlords can sell the property, raise rent, and even refuse to rent. Owners do not have to face these problems as they are both their own landlord and renter. Owners can also feel a sense of security and community within their home and neighborhood. Owners have a greater housing design flexibility than renters. From wall colors to carpet to toilets, you can choose any color that fits your style in addition to choosing location, size, and quality of your home. Homeowners also have the freedom to add additions to their house and enhancements to the backyard. Renters do not have this luxury. With renting, you are stuck with the design elements and quality that currently resides in the apartment. Renters can, however, decorate the interior to suit their tastes and style. Financial savings and investments: Do you have enough savings? Is owning a home an investment that you want to make or are you just buying a home because you feel like you should? You have to decide if owning a home is worth the financial investment. In addition, decide if this investment is one that you can afford to make at this time. Length of stay in location: How long are you planning to stay in the area? Do you move around a lot for work? If you are not going to stay long in your current location, renting may be your best bet. For those who plan to stay long-term, owning might be a more suitable investment. Stress: Can you handle the stress associated with buying and owning a home? Remember that with owning a home comes a change in financial state, mortgage and loan payments, along with a change in residence and living conditions. If you have recently gotten married, had a baby, or switched careers, renting might temporarily be a less stressful option, as too much stress can lead to missed payments, resulting in destroyed credit and potential loss of your home. Age: If you are in you 20's and 30's, owning a home might not be the best option as it will tie you to a specific area and you might not get to explore all that life has to offer you. If you are approaching retirement age, will you feel like spending money on updates and maintenance or would you rather spend it on travel? There is a feeling of being grounded that comes with owning, while renting provides a feeling of adventure. No matter what your age, you should feel confident and secure in your choice. While the decision to own or rent is very much an economic and financial decision, it is also a lifestyle choice. In most cases, the choice is driven by household functions such as marriage, family, and affordability. The choice also depends on your emotional health. While the reasons might not seem rational to others on the outside, if it feels good to you then you know that you have made the right housing decision.